I've been forewarned that the Natural History Museum was going to be packed seeing that it was the half term break after all. Yup, it sure was. The line snaked around the garden with a waiting time of 45 minutes. We took the time to admire the stunning Waterhouse building and count the number of snarling wolves and proud lions staring down at us from the rooftops. 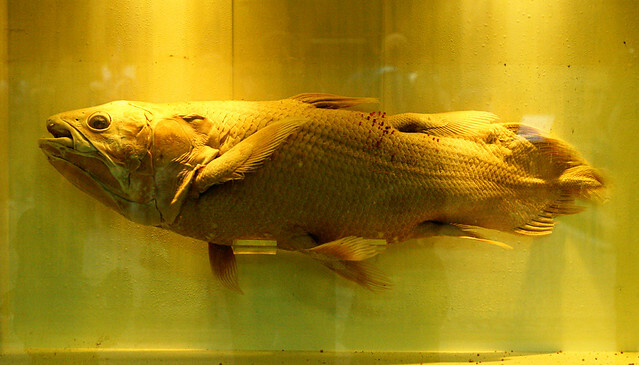 This coelacanth was caught in 1960s and preserved. As a result, it has lost its natural coloring. What's remarkable is that the coelacanth was thought to be extinct 85 million years ago until one was caught off the coast of South Africa in 1938. Since then, they'd found a colony of these fish living in deep water off the coast of the Comoro Islands, north-west of Madagascar. Lil L was goggle-eyed when she saw fossils and skeletons of dinosaurs. This 5 year old taskmaster made me read every single exhibit until I was too hoarse to talk. 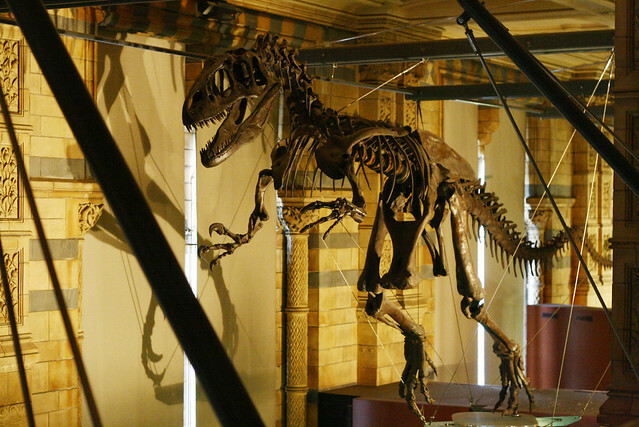 How could we miss the monstrous T-Rex? Here's the obligatory photo of Lil L as requested by Heather taken on the grounds of the museum. Since mom's enamored with all things French, she's wearing a Petit Bateau dress and the infamous Catimini trenchcoat. Despite speaking with a proper English accent, she's a typical Asian when it comes to food. Her favorite snack is the fried dough stick which she would eat day and night if I don't put a stop to it. We decided to go to Chinatown to get some. This is my favorite Chinese bakery in Chinatown. 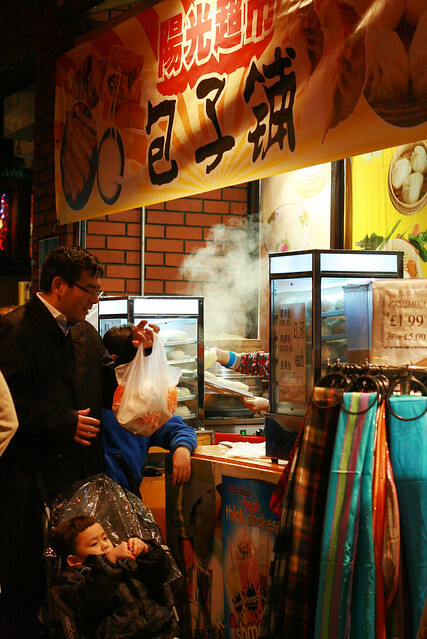 It's where I pick up tofu jelly, fried dough stick, roast pork bun and the like at very reasonable prices. We passed through seedy parts of Chinatown. A lady spoke so sweetly to Lil L and then proceeded to herd passerby into her massage parlor. We thought we'd check out a Taiwanese place. The spicy Taiwanese beef noodles have been on my mind since my friend Kat of Feather Factor talked about it. It was a bad BAD mistake. The noodles were overcooked and looked nothing like the original version. The big pieces of beef were tough and inedible. The soup was tasteless. We were also entertained by the waitress who proceeded to describe in detail about her stomachache and diarrhoea. Furthermore, she had a bit of a bad cough so we were all sprayed by her germs because she didn't think it was all that important to cover her mouth. Lovely. The toilet hasn't been cleaned since the Ice Age. The only saving grace was their Xiao Long Bao (little dragon buns). There was a long queue for these steaming hot meat paos (buns). We were too full to contemplate eating anything. We took a stroll around Chinatown to check out the shops and lights. The place is brimming with tourists and locals. The supermarkets were all open for business with all kinds of vegetables and fruit for sale. The Lucky Cat which can be found at nearly all Chinese establishments. 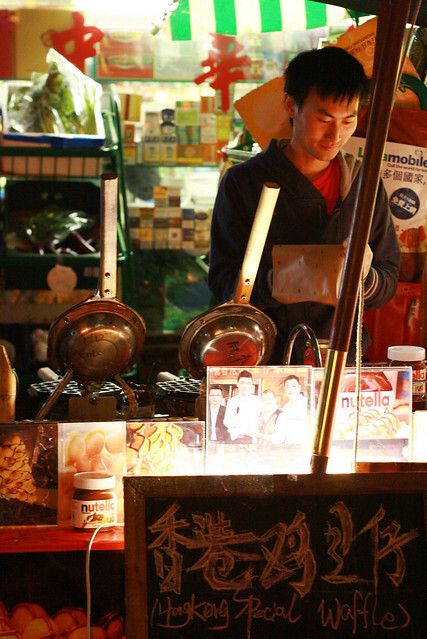 The Hong Kong version of the Nutella crepe. 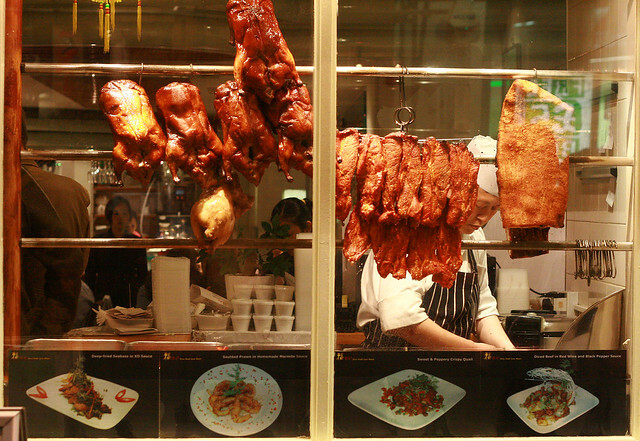 The yummy roast duck and crackling pork which can be found in every Cantonese restaurant. I'm not a fan of durians but the rest of my family are. Euw. Sorry. Can't help it. Hope you've enjoyed our little trip as much as we had! We have a museum of natural history in Chicago too, and it is always packed during holiday break! Sooooo sorry to hera about the spicy noodle place and how the waitress willingly discussed her stomach troubles...yikes! I saw those egg tarts and I was about to start salivating all over my laptop...it's confirmed I am off to dimsum this wknd. I love the China town and I loooove the sweets and pastries! There is always room for moon cakes and HK egg tarts. I think I was Chinese in my past life o.O. Damn you and your enticing photos lol now I've build up a huge appetite for crispy duck. Not a fan of smelly durians either. I'm scared of Durians! We can't get them here but I have heard horror stories!! So love these colorful snapshots into your world. great photos. i so wish we had an amazing museum like that near by. and how cute is she! derek, it's funny in hindsight but boy, was I furious! Actually, more furious about the horrid food. Bessie, I so wanted to get the egg tarts but wasn't sure I was going to haul everything back home. LOL. 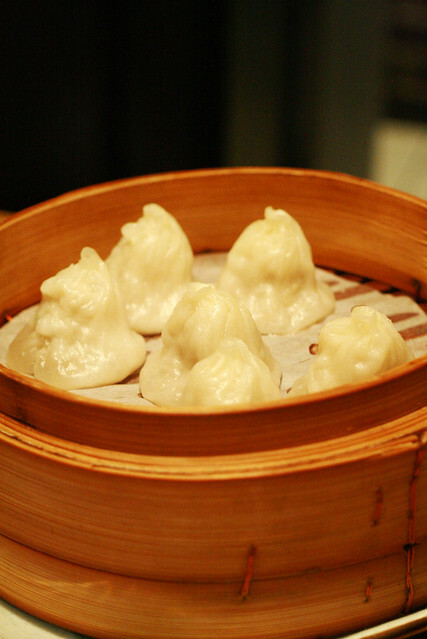 Have a great dimsum this weekend. Lily, hahaha....yes, if you weren't Greek, for sure I would've thought you're Asian seeing you read and write too! There's one by Bayswater that had one of the best roast duck I've ever tasted. Heather, **hugs** So sweet of you to say so. LOLOL! Believe it or not, my SIL desperately wanted Chinese food in Istanbul. Yup, you didn't misheard me. They found some but weren't impressed. I-Ping, really??!! You'll have to tell me where to find the best roast duck in London. lauraloo & skippysays, you and me both. I nearly passed out when friends decided to surprise me with the "house special" - durian ice cream cake. Unfortunately, Lauren was given some on our last visit to Borneo and LOVED it. I mean...euwww. amy, there are truly some incredible museums in London. I love the city but I'm glad to leave it too because the hustle and bustle can be overwhelming. A fried dough stick? Oh what joy is this? 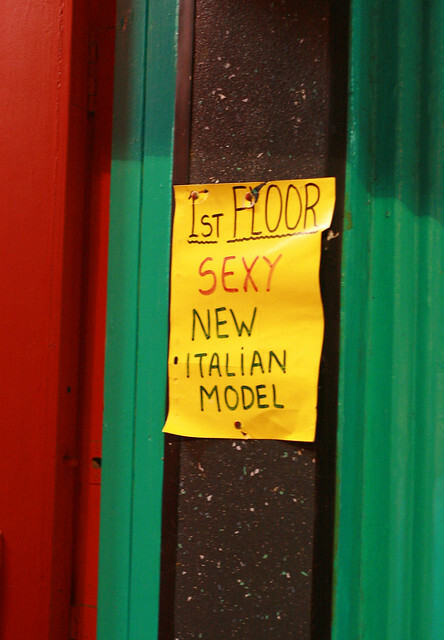 Dying at the Italian model pic! Yep, if you meet me you'll think" yeah she looks 47!" Oh then tell me about the best roast duck in London! Tabitha, It's like a soft doughy bread which has been deep fried. It's ok for a scrawny 5 year old to eat tons of it but not me. How do you explain your slender figure, huh? I'm a decade younger but by golly, there's no way I could've squeezed myself in those tiny skirt of yours unless I don't ever exhale. The best roast duck, in my humble opinion is Four Seasons at 84 Queensway, W2 3RL right by Bayswater tube station. It's packed with Asians so you know you're in the right company. The only thing is you'll have to go early. Don't even think about waiting for a table after 6.15pm if you forget to book because you're in for a long wait. 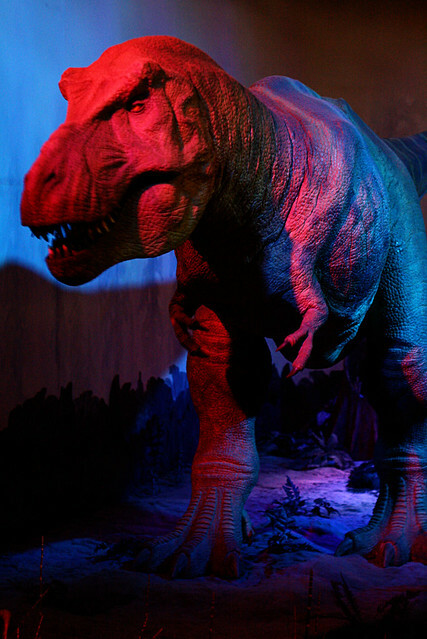 Those are wonderful pictures at the museum, especially T-Rex with the red and blue lighting! 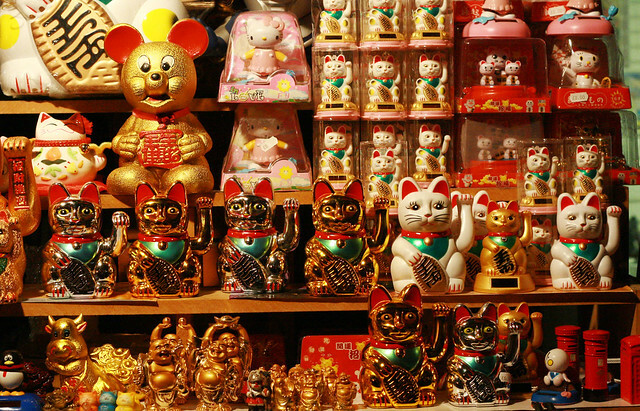 And LOVE the Chinatown pictures, especially the lucky cat!! They always bring a smile to my face! Lil L is so cute!! I do love all your clothing choices for her!! Sharon, I think your boys will go crazy at the Natural History Museum. There are so many interactive exhibits that I doubt they will ever get bored. I-Ping, Oh yes, their yummy boneless duck. Love that. Do you miss living in London? Ahhh, how did I miss this post?? I love Natural History Museums! Kat, THANK YOU!!! I'm struggling to find good Asian restaurants. Will definitely try this on my next trip to London. FnF, that's the great thing about having a little girl. You can dress her up like w little doll (well, to a certain degree before she thinks her mom has gone mad) and take them out and do girly things. I also love Four Season Roast Duck, the one in Chinatown is also great. 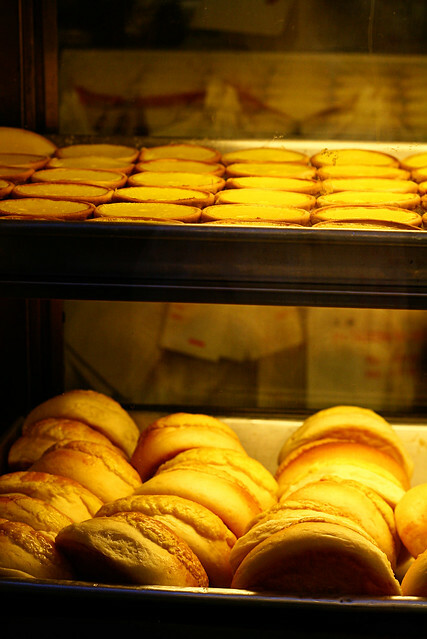 What's your favorite Chinese bakery that you mention (but not name) above? One of these days, I'll need to find out the name of the bakery. 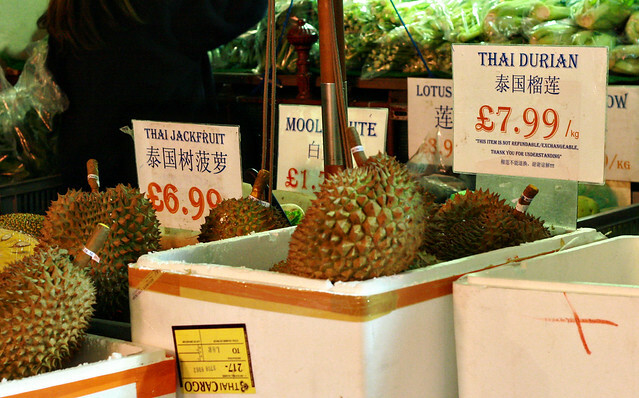 It's just right by the tube station as you walk into Chinatown. OK, thanks... will look for it on my next visit!